See top Philadelphia sights including the Historic District, Penn's Landing, the Italian Market, the Benjamin Franklin Parkway and Society Hill on a stimulating 1-hour or 2-hour Segway ride. Complete a 5-mile or 10-mile loop – with the opportunity to ride along the Delaware River Trail. This small-group tour is limited to six people, ensuring more personalized attention from your guide. 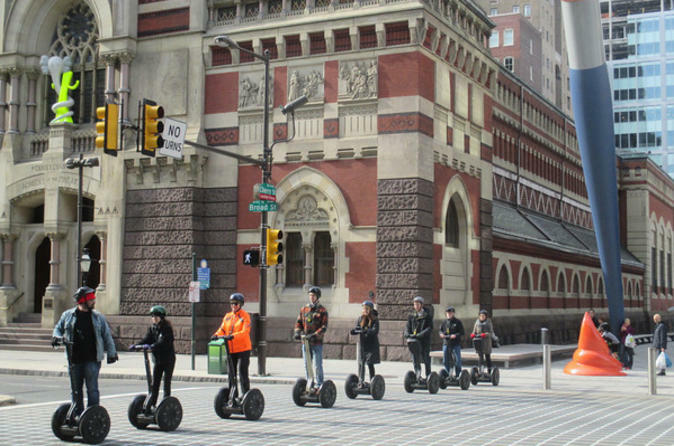 Start your Segway tour of Philadelphia with an instructional orientation and safety briefing. Once you're comfortable, follow your guide on a five-mile or 10-mile route. Along the way, your guide will take fun photos of you and regale you with fascinating facts about Philadelphia's history. See more than 15 Philadelphia attractions on this loop! This introduction to major city sights takes you through the Historic District and to Penn's Landing and the Delaware River via Welcome Park. Cruise along the river and past historic homes. Continue past the bustling Italian Market with beautiful murals painted on several buildings, and admire the lively mosaics of Magic Gardens on South Street. Along your journey, witness several important historical sights including the First Bank of the United States and several old churches where William Penn developed his 'freedom of worship' philosophy. Extend your Segway adventure, passing by Elfreth's Alley and the Betsy Ross House. Admire Independence Hall en route to Society Hill, where you can marvel at the stately homes. Continue over Avenue of the Arts to Rittenhouse Square before winding through the Fitler Square neighborhood. From there, make your way along the Schuylkill River en route to the Philadelphia Museum of Art, where you can see the statue of Rocky Balboa at the bottom of the famous steps he ran up in the 1976 blockbuster movie Rocky. Next, cruise on to Benjamin Franklin Parkway to see the 'Thinker' statue in the outdoor sculpture garden of the Rodin Museum. Head through some of the city's back streets to the Pennsylvania Academy of Fine Arts and then through Chinatown to end your tour.